Updated: Oct. 9, 6:00 p.m. In an auditorium filled with colleagues, students, reporters and staff who roared with applause as he was introduced, Daniel Kahneman talked on Wednesday about the pioneering work he has done integrating psychological research into economics, for which he was awarded the 2002 Nobel Prize in economic sciences. A video of the news conference is available at WebMedia. It is useful for listening to the audio portion. An audio-only version will be posted soon. Kahneman has been the Eugene Higgins Professor of Psychology and professor of public affairs in the Woodrow Wilson School of Public and International Affairs at Princeton University since 1993. In its announcement, the Royal Swedish Academy of Sciences cited Kahneman "for having integrated insights from psychological research into economic science, especially concerning human judgment and decision-making under uncertainty." Kahneman's work, it said, has laid the foundation for a new field of research by discovering how human judgment may take shortcuts that systematically depart from basic principles of probability. Asked how he learned that he had won the prize, Kahneman said, "At 9:15 (this morning) someone with a very distinct Swedish accent called, and he read me a citation -- actually, I was a bit excited, I suppose I didn't really hear it. And then he said . . . I will give you the chair of the committee, who happens to be someone I know, and so we verified that this was for real and not a particularly nasty crank call." 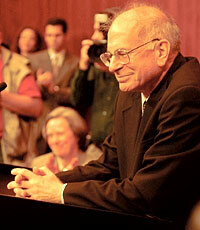 Kahneman was awarded the economics prize along with Vernon Smith, a professor of economics and law at George Mason University. Kahneman and Smith will share the $1 million prize money. "We are honored to have Professor Kahneman on our faculty, and delighted that his work has gained this important international recognition," said Princeton President Shirley M. Tilghman. Asked what the prize meant to him, Kahneman said, "The work for which I'm honored is work I did collaboratively with a close friend and a very famous psychologist, Amos Tversky, who died in 1996. Certainly we would have gotten this together, and that's one of the things that this means to me today. There is that shadow over the joy I feel." Editors: The previous news release is still online. More information about the award is available on the Nobel site. Including Kahneman, nine members of the current Princeton faculty and research staff have been recipients of a Nobel Prize. A list of Princeton University's Nobel Prize winners is also online. Daniel Kahneman speaks at a quickly arranged news conference Wednesday. 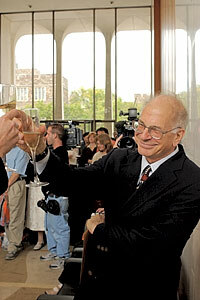 Afterward, a celebration is given in his honor in Robertson Hall. 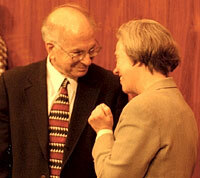 Princeton University President Shirley M. Tilghman congratulates Kahneman.